​Adults with a disability may have modified or adapted methods of communication. Many may find it hard to express their needs and this may lead to frustration and / or behaviours that are unusual or extreme. For some just telling someone that they are feeling pain may be difficult. Parent-Carers understand what is being communicated and have over the years developed effective ways of responding to their son or daughter’s needs. In the following video you will meet Tim’s mother, she is talking with health staff about his communication and she provides hints and tips (TOP5 strategies) to help staff personalise their communication with Tim. Instructions: View the video and write Tim’s TOP5. Check your answers against the sample below. What is the issue? Tim is non-verbal, and staff don’t readily understand his vocalizations does this occur? Why does this occur? Tim communicates with gestures. ‘Yes’ by tapping his head, and ‘No’ by shaking his head vigorously. How can we resolve this issue? Ask Tim simple questions requesting a ‘Yes’ or ‘No’ answer. 2. What is the issue? Tim growls and staff are concerned that he may be aggressive. Why does this occur? Tim growls when his ‘possessions’ are not with or around him. How can we resolve this issue? Make sure that Tim has his magazine and phone with or near to him. 3. What is the issue? Tim doesn’t understand the concept of pain, but he does experience pain. Why does this occur? 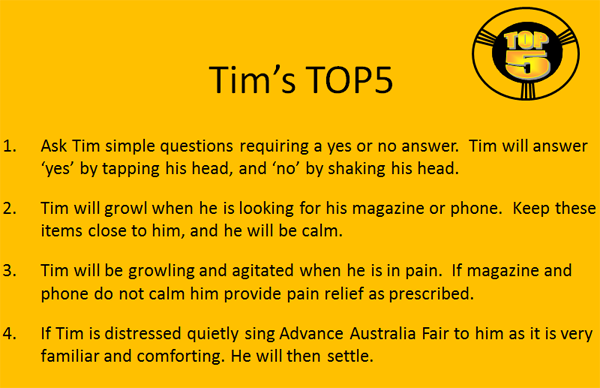 Tim cannot respond ‘yes’ or ‘no’ when asked about pain, but indicates pain by ongoing growling and agitation. How can we resolve this issue? First line of response to growling is to provide his phone and magazine. If Tim continues to growl provide pain relief as directed by medical staff. 4. What is the issue? Tim can become distressed and finds it hard to self soothe. Why does this occur? Unfamiliar environments can frighten Tim. How can we resolve this issue? Sing ‘Advance Australia Fair’ close to his ear and after a few repeats he will settle.